This is my personal blog about Insanity FlyFF Private Server. If you are a beginner who is looking for some tips, guide and/or insight about the game, this is the best place for you. You will find almost everything here. If you enjoy reading my blog, please feel free to share this to your friends. After you have created a character, you will be equipped with the following items: 4 Pcs. of Starter Exp Potion 150%, Beginner Set (F), Magic Broom for Beginners (Event) - you will not be needing this. 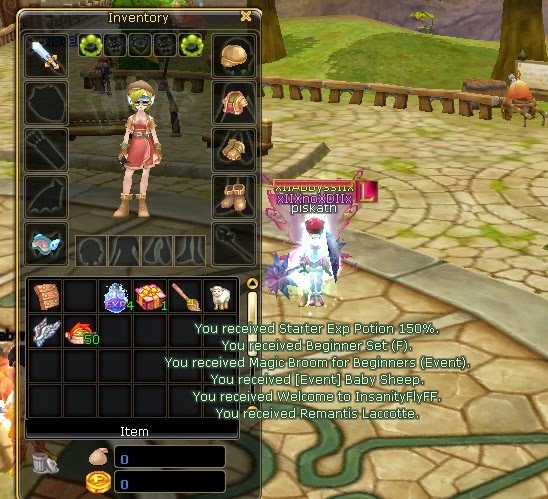 A looter pet [Event] Baby Sheep, Welcome to Insanity FlyFF Wing Mask, and 50 Pcs. of Remantis Laccotte. Complete your jewelry set: For beginners you can't use the premium jewelry set with additional stats and set effects - which only available in the Item Mall. There are also Jewelry set with additional set effects and with required level of 150 - which can be dropped from Boss monsters. So, your only option is to equip with the regular jewelry without set effects, such as: Stam Ring, Demol Earrings, Gore Necklace, Plug Earring, Vigor Ring, Arek Ring, Mental Necklace, Intelli Ring, Meteofy - which an Event item. Prepare your Fashion Set: There are 2 types of fashion set; (1) the premium fashion set which has an additional set effects or additional stats. and (2) normal fashion set with no additional stat. But you can all awake each parts using the Scroll of Awakening. Prepare your Armor Set: Your are current equipped with a Plus (+) 10 armor with awake. You can just leave the current awake, or you can re-awake the parts. You can use the Scroll of Reversions - this is to remove the existing awake on your items. Then, using the Scroll of Awakening to awake again. To make it even stronger, you can upgrade your Armor suit by Piercing. You are allowed to pierce up to 4 slots - you can only cards designated for the armor. Mostly with the percent (%) cards (card 4%, card 7%, card 10%, card 12%) are used in piercing. Enhance your Shield. You don't need to change your shield, it has a good awake. You just need to upgrade it by Piercing Cards. This will increase its attack power or gives your additional Stats depending on your choice. Additional items you will be needing are: Looter Pet (you can upgrade this to open slots up to 9 - which you can insert beds to give you additional stats); Cloak (for beginner, just get a regular one and awake it); Wing Mask or Glasses, Stone Cut, Exp Potions and Buffs. This is the Part I - Preparing your items for Leveling up. To continue, here's the Part II. Comments that are irrelevant to the topic will be deleted. Follow Me: Get the Latest Updates. Enter Your Email Address to Receive the Latest Updates. Insanity Flyff Private Server 2013-2018. Dumaguete City. Simple theme. Powered by Blogger.